Imagine a hiring manager reading her way through a pile of cover letters and resumes. Each one is filled with the same empty phrases. Communication skills. Sales ability. Problem-solving. Team leadership. Bored yet? One proven way to get a hiring manager’s attention, prove your worth, and be remembered is to tell stories. The Challenge-Action-Benefit model is a simple and compelling strategy to turn your cover letter (or sometimes a resume) from ho-hum to memorable. Briefly identify a problem or obstacle you faced in the workplace. Describe the specific actions you took to resolve the problem. …I spearheaded a new consultative sales approach. …I developed an automated account tracking system. Spell out the positive outcomes your company saw as a result of your actions. Use cold hard numbers whenever possible to prove how important your contributions were. Within 6 months, net sales were up 25%. I recouped $250K in revenue by bringing 95% of accounts up to date. Granted, you may not know exactly how many leads you generated or how many sales resulted from your new marketing plan. Of course be honest and accurate in your statements. But don’t be afraid to put a ballpark estimate on your work. In a resume, numbers are like gold. Consider constructing your cover letter out of a few short challenge-action-benefit stories. Each should be no more than few lines long, and each should focus more on outcomes and benefits and less on all the steps you took to get there. 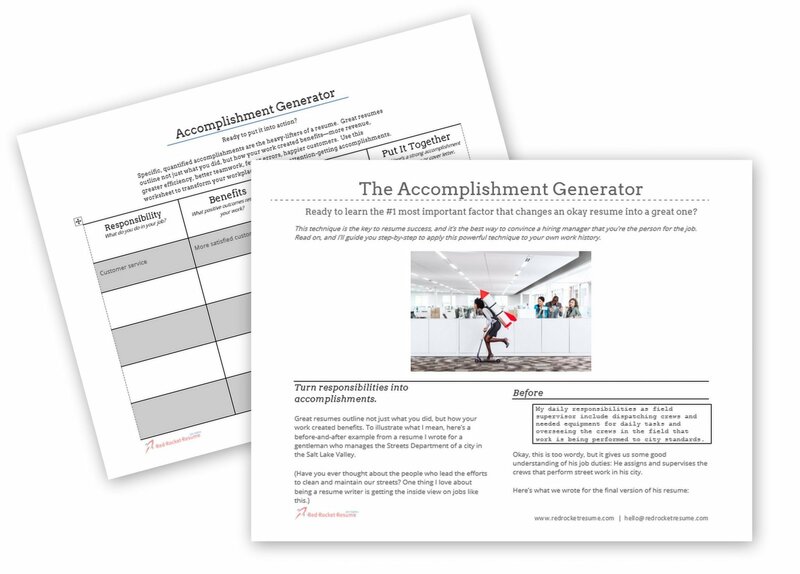 Challenge-action-benefit stories can also be a good way to brainstorm resume content. If you’re struggling to quantify your accomplishments at a specific job, try jotting down a few challenge-action-benefit stories. What problems occurred at that job? What did you do in response? And how were things better as a result? The answers to those questions may help you write strong, accomplishments-based bullet points for your resume.